Brunch with Bunny is tomorrow! For details, see below under events. 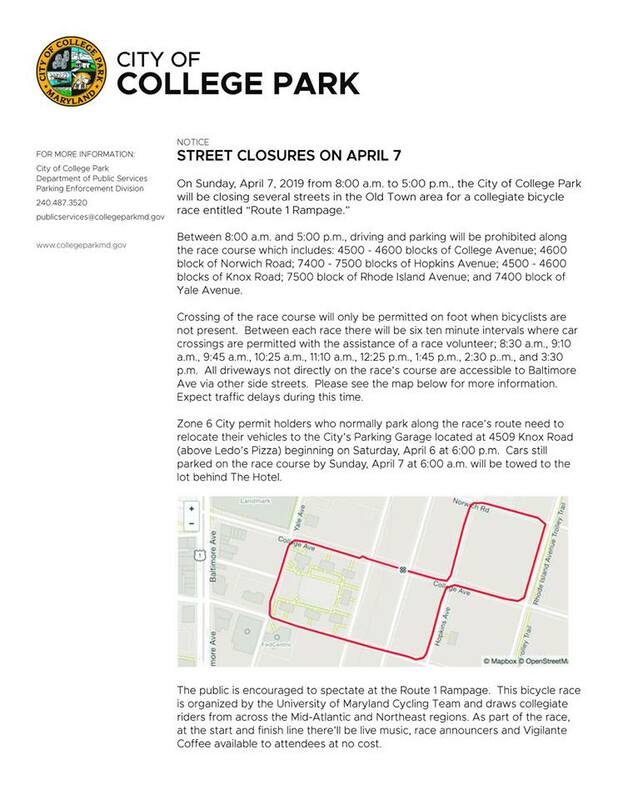 Between 8:00 a.m. and 5:00 p.m., driving and parking will be prohibited along the race course which includes: 4500 - 4600 blocks of College Avenue; 4600 block of Norwich Road; 7400 - 7500 blocks of Hopkins Avenue; 4500 - 4600 blocks of Knox Road; 7500 block of Rhode Island Avenue; and 7400 block of Yale Avenue. Crossing of the race course will only be permitted on foot when bicyclists are not present. Between each race there will be six ten minute intervals where car crossings are permitted with the assistance of a race volunteer; 8:30 a.m., 9:10 a.m., 9:45 a.m., 10:25 a.m., 11:10 a.m., 12:25 p.m., 1:45 p.m., 2:30 p.m., and 3:30 p.m. All driveways not directly on the race’s course are accessible to Baltimore Ave via other side streets. Please see the map below for more information. Expect traffic delays during this time. Zone 6 City permit holders who normally park along the race’s route need to relocate their vehicles to the City’s Parking Garage located at 4509 Knox Road (above Ledo’s Pizza) beginning on Saturday, April 6 at 6:00 p.m. Cars still parked on the race course by Sunday, April 7 at 6:00 a.m. will be towed to the lot behind The Hotel. The public is encouraged to spectate at the Route 1 Rampage. This bicycle race is organized by the University of Maryland Cycling Team and draws collegiate riders from across the Mid-Atlantic and Northeast regions. As part of the race, at the start and finish line there’ll be live music, race announcers and Vigilante Coffee available to attendees at no cost. 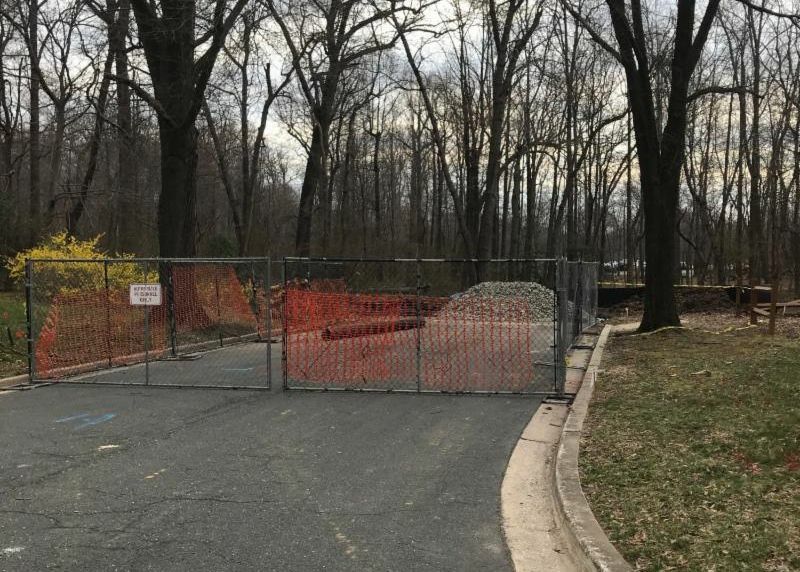 College Park Woods Trail Construction Begins! Construction of the College Park Woods Trail has begun! The new trail is scheduled to be completed February 2020. This trail will connect the College Park Woods neighborhood to the Paint Branch Trail (and the rest of the Anacostia Tributary Trail system). April is spring cleanup month. The Department of Public Works, 9217 51st Avenue, will be open each Saturday from 7:30 a.m. – noon for City residents to drop-off bulky trash, electronics for recycling, brush, and yard trim. 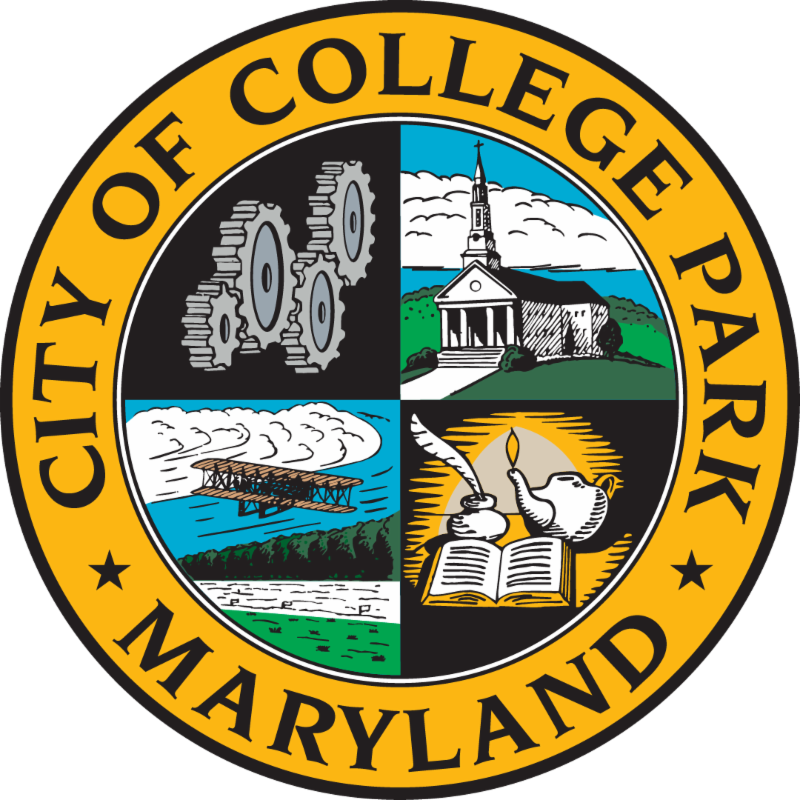 You must be a resident of the City of College Park and bring proof of City residency in order to participate. Document shredding: Onsite document shredding services will be available on Saturday, April 20, during the Cleanup event from 8:00 a.m. – 12:00 p.m. Bring your paperwork to be shredded while you wait. Residency is required. Drivers should add extra commute time and use alternate routes during this work. The work may require temporary work zone sidewalk closures. Pedestrians will be directed via signage to the safest crossings in the work zone—including those on the opposite side of the road. Additional work hours and lane closures may be necessary to complete all phases of work and keep the project on schedule. Progress permitting, this gas line infrastructure relocation work should be complete by late fall 2020. Equipment used for this work may be disruptive. For more information about this US 1 gas line infrastructure relocation work, please contact Mr. John Gover, Maryland Department of Transportation State Highway Administration (MDOT SHA) District 3 Area Construction Engineer at 301-513-7336 or wgover@sha.state.md.us . Early Gardener Special - 25% off SMARTLEAF® Compost! Sale is for Pickup Only. 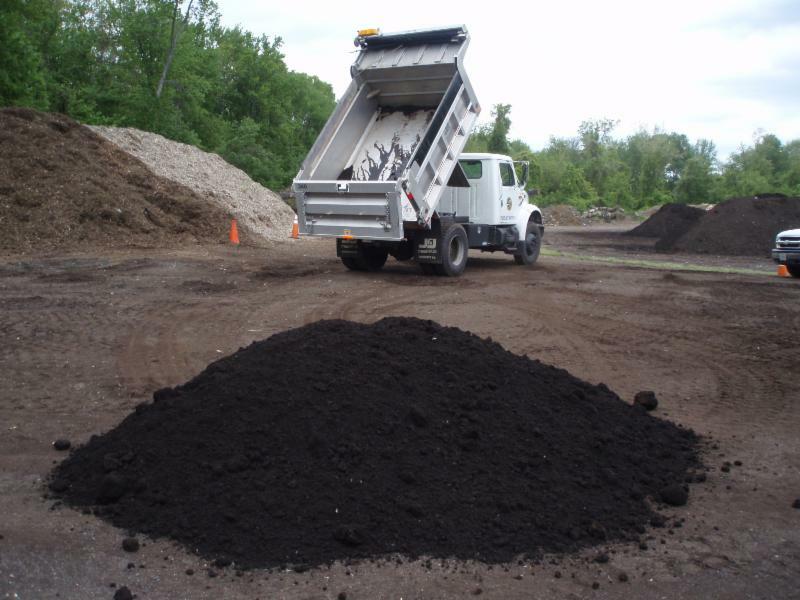 For a limited time only, the City is offering our top-grade screened compost for only $21/cubic yard – 25% off its regular price of $28/cubic yard! You must pick-up your purchase at the Department of Public Works (9217 51st Avenue), Monday through Friday, between 7:30 - 11:45 a.m. and 1:00 - 3:00 p.m. The Department will be open on Saturdays in April from 7:30 a.m. until noon. For more information about the City's SMARTLEAF® compost, visit www.collegeparkmd.gov/compost or call 240.487.3590. *Discount is for pick up only. While supplies last. City residency is not required. City Manager Scott Somers and Finance Director Gary Fields convened the Grants and Sponsorship subcommittee of the Council, to discuss and review final recommendations for a grants and sponsorship policy, and the application process for those entities seeking a City grant or sponsorship opportunity. The recommendations and application process will be presented for discussion and consideration at a future City Council meeting. City Manager Somers attended a Washington Council of Governments (WACOG) CAO meeting. This meeting is an opportunity for Capital Regional local government managers to exchange knowledge and information, network, and learn about WACOG programs such as cooperative purchasing opportunities and Homeland Security and Public Safety collaborative efforts. City Manager Somers and Councilmember Mitchell participated in a Maryland Municipal League (MML) Legislative Committee conference call. The purpose of the call was to wrap up and finalize legislative priorities as the State’s legislative season comes to a close. The City Hall Project Team, which includes representatives from the City, the University, the TDC, the City’s Project Manager, and the Contractor, met to review and discuss updated project costs, schematics and concept plans. As said previously, the City has had to pare down some of the anticipated programming due to budget constraints. An update on programming, design, costs, and timeline is tentatively schedule for the April 16 City Council meeting. City Manager Somers participated in a conference call with the City’s development consultant, HR&A, regarding on how best to divide ownership of the City Hall block once the project is complete. The City and the Terrapin Development Company (TDC) both currently own portions of the block, most of which is owned by the City. HR&A will complete an analysis of credits and debits associated with current and future ownership. The results will be utilized as part of a development agreement between the City and the University; the City Council will be asked to consider approving it at a future Council meeting. Economic Development Coordinator Ryan Chelton, Public Services Director Bob Ryan, and City Manager Somers attending the First Thirsty Thursday (FTT) event at Nando’s Peri-Peri. FTT is a monthly event where University staff and City residents and staff are encouraged meet one another, discuss current issues and network in a casual atmosphere. Hollywood Gateway Park bi-weekly construction update: The concrete foundations for the pavilion were poured and inspected. Soil tests have been ordered and work has begun to grade and pour concrete for the sidewalk ramps inside the park. No problems have been identified and work is on schedule. Hollywood Commercial District Streetscape Project: Notices were sent to property owners and residents in the vicinity of the project to inform them that personnel from Wallace Montgomery (the City’s engineering consultant) would be performing field surveys and geotechnical and environmental investigations in the rights-of-way. This work is necessary for the final design of streetscape improvements in the commercial area and along Narragansett Parkway. Duvall Field Visioning Project: Save the date of May 13, 2019 at 7:00 pm when Greenplay LLC will present the results of the community outreach effort and a conceptual plan for proposed improvements to the park area. This meeting will be held at Davis Hall. The City received notification from the Maryland Department of Planning that our grant request of $34,385 was approved to assist with outreach efforts for the 2020 census. The City’s new food scrap drop-off pilot program began on April 1 to much excitement - residents have been very positive about the program! To date, we have given out 45 of the 50 free promotional 5-gallon buckets. Residents can drop off their food scraps at a 24/7 accessible yellow food scrap cart located in the back left corner of the Department of Public Works (9217 51st Ave) parking lot with yellow flags around it. For more information, click here . Request for Exemption from Adult Mosquito Control Services. Maryland Department of Agriculture Mosquito Control Program will begin in late May. Any resident who wishes to have his/her property excluded from adult mosquito control pesticide applications by truck-mounted ultra-low volume (ULV) sprayers must fill out this form annually. Click here for application. Contracted grass mowing began this week. The City’s scheduled mowing day is Thursday, weather permitting. Right-of-way areas south of Route 193 were mowed on Thursday, as well as Duvall and Calvert Road School athletic fields. Next week the right-of-way areas north of Route 193 will be mowed as well as the 2 athletic fields. The initial delivery of 40 replacement street trees was received; tree planting is underway. The City will be celebrating Arbor Day on Friday, April 26th (National Arbor Day) at 9:30 am at St Andrews Episcopal Church, located at 4512 College Ave. The City will receive the Tree City USA award for the 30th consecutive year. All are welcome to attend. Compost and wood mulch deliveries have resumed. Sp ring is a great time to plant trees. If you would like a tree planted in the right-of way in front of your home please contact Brenda Alexander to discuss options, 240-487-3595 or balexander@collegeparkmd.gov . Are you thinking of adding a tree to your property this Spring? The City has a program to reimburse the cost (up to $150.00) of approved trees on private property, it’s called the Tree Canopy Enhancement Program (TCEP). Click here for more information and application. The Department is located at 9217 51st Ave.
50-gallon rain barrels for $72. Click here for more information. Yard Waste Carts for City residents for $25. Click here for more information. Backyard Composting Bins for $20 (City residents) and $40 (non-residents). Click here for more information. SMARTLEAF® compost ($28 cubic yard) and wood mulch ($12 cubic yard) are available for pick up and delivery. Click here for more information. 3/22 Contract officer located an unoccupied stolen vehicle (RAM pickup truck) at the hotel located at Branchville Road and 51st Avenue. WAVE Unit responded and took over the investigation. 3/25 Contract officer heard the sound of gunshots at Rhode Island Ave and Iroquois Street. The area was checked with negative results. 3/25 Contract officer conducted a traffic assignment (Speed Enforcement) at Saint Andrews Place and Bridgewater Street. 3 citations and 1 warning were issued. 3/26 Contract officer responded to a call for service for a report of a male living out of a vehicle in the 9600 block of Rhode Island Avenue. Officer located the vehicle, but the male was GOA. Officer waited a period of time, but the male never returned. 3/26 Contract officer responded to a call for service for a report of a suspicious male at 8419 Baltimore Avenue (Best Western). The subject was located and arrested for 4 outstanding warrants. 3/27 Contract officer conducted a traffic assignment (Speed Enforcement) in the 9000 block of Baltimore Avenue. (30 citations were issued as the officer was operating the portable “Mobile Camera”). 3/27 Contract officer responded to a call for service for a report of a missing person in the 4300 block of Knox Road. The Contract Officer along with the Beat Officer located the subject at Cool Spring Road and 26 th Avenue (under the power lines). The subject was EPS by the patrol officer. 3/28 Contract officer on routine patrol observed a male walking along Princeton Avenue at Knox Road with an open alcoholic beverage (beer). The student was referred to the university. 3/28 Contract officer on routine patrol observed a male walking along Rhode Island Avenue at College Avenue with an open alcoholic beverage (beer). The student was referred to the university. Due to the ongoing complaint regarding fire lane violations at 4300 Hartwick Road we conducted several checks and issued 2 parking violations this week. You're invited to Brunch with Bunny! 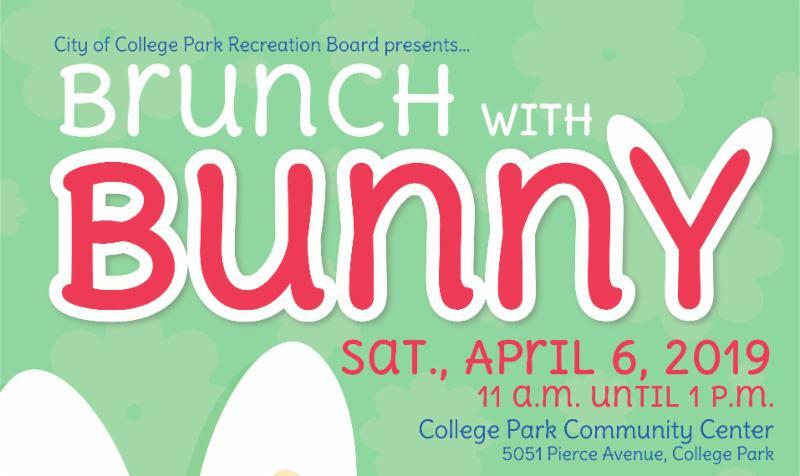 Join us on Saturday, April 6 from 11:00 am until 1:00 pm at the College Park Community Center (5051 Pierce Ave). The first 200 guests will enjoy free refreshments, photo ops with the Bunny and friends, arts and crafts and a special show by magician Tim Hall from 11:15 until noon. For more information, email publicservices@collegeparkmd.gov or call the Community Center at 301.441.2647. Presented by the City of College Park's Recreation Board. It's the City of College Park's Annual Spring Egg Hunt! 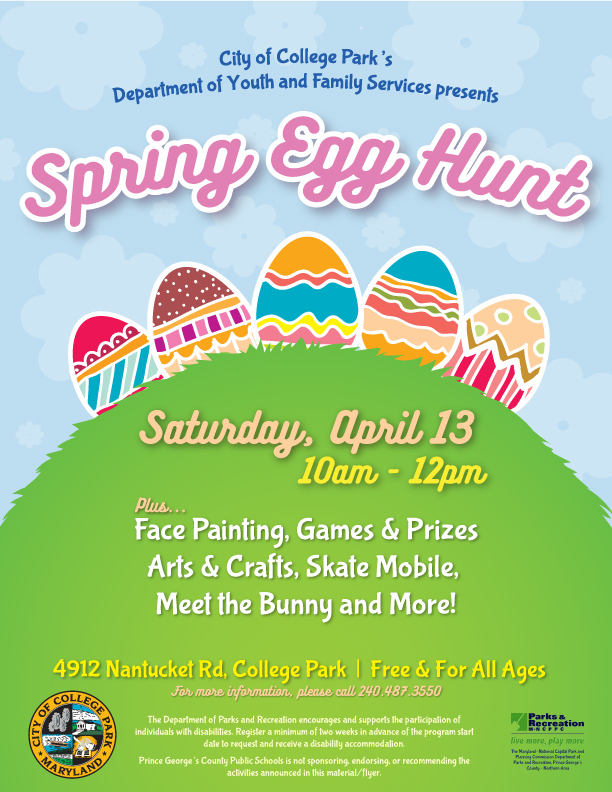 Join us on Saturday, April 13 from 10:00 am to 12:00 pm at the City's Youth and Family Services (4912 Nantucket Rd) for a spring-time fun egg hunt. There will be face painting, games, prizes, arts and crafts, meet the Bunny and more! For more information, contact the Department of Youth, Family and Senior Services at 240-487-3550. 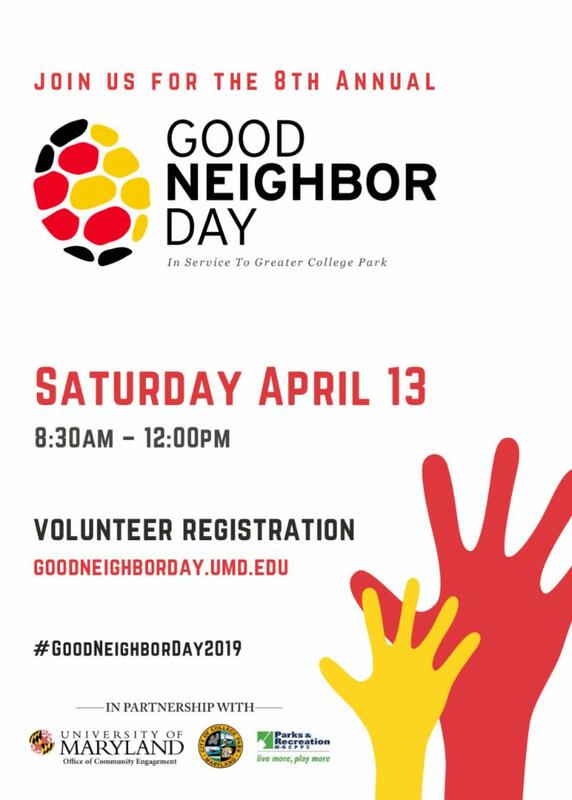 Join more than 900 volunteers for more than 20 service projects throughout Greater College Park in a community-wide day of service for the 8th Annual Good Neighbor Day on Saturday, April 13! Volunteer registration opens on Monday, March 4. Register at goodneighborday.umd.edu. 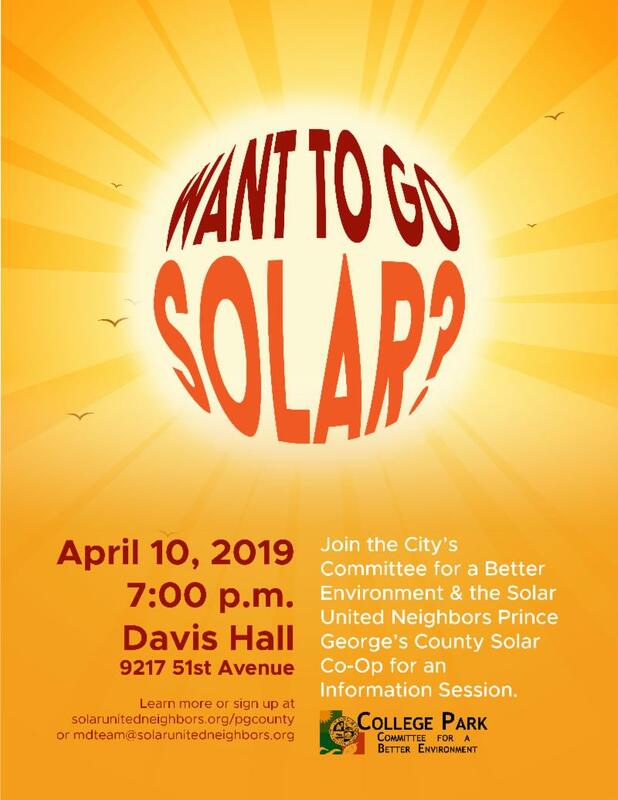 Join the City's Committee for a Better Environment and the Solar United Prince George's County Solar Co-Op for an information session on April 10 at 7:00 p.m. at Davis Hall. Tuesday, April 9, 2019 - 7:30 p.m.
Tuesday, April 16, 2019 - 7:30 p.m.